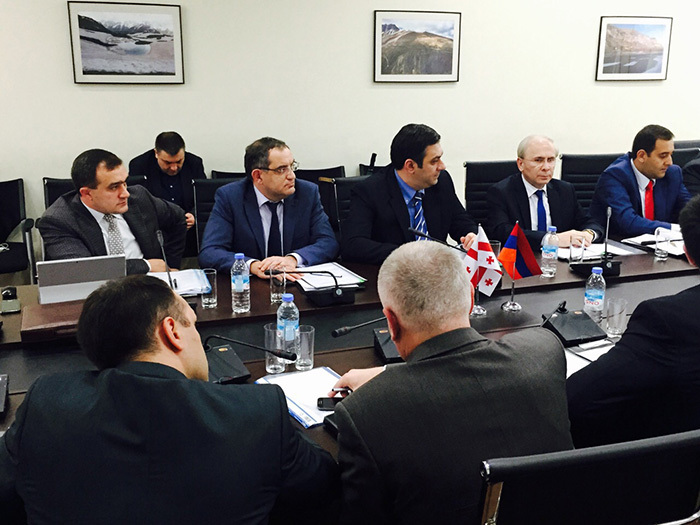 On October 7, 2016 Armenian and Georgian joint committee session took place for the selection of technical supervision consultant for the design and construction of new constructed bridge over river Debed at Sadakhlo-Bagratashen crossing point area of the state border of the Republic of Armenia and Georgia . During the meeting the joint committee summarized the results of the 1st evaluation stage and approved the short list of participants. The participants included in the list at the 2nd stage will be suggested submit technical and financial proposals. 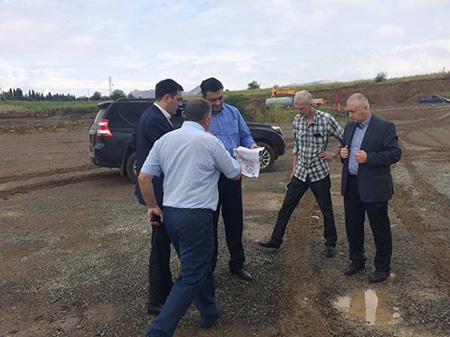 On June 1, 2016 the Armenian and Georgian professional working team conducted a working visit to the "Sadakhlo-Bagratashen" border crossing point of the state border for new bridge construction over river Debed at the "Sadakhlo-Bagratashen" crossing point area of the state border between the Republic of Armenia and Georgia. The meeting of the parties took place at cross-border section of the two countries. Issues related to the border crossing simplified procedure application mechanisms, establishment of bypass roads and construction site, maintenance of smooth operation and security rules of the railway located at Georgian side, land status at the area envisaged for the bridge construction and in adjacent areas, environmental and archaeological impact, as well as to the general inventory of the current issues and bridge construction, were discussed. 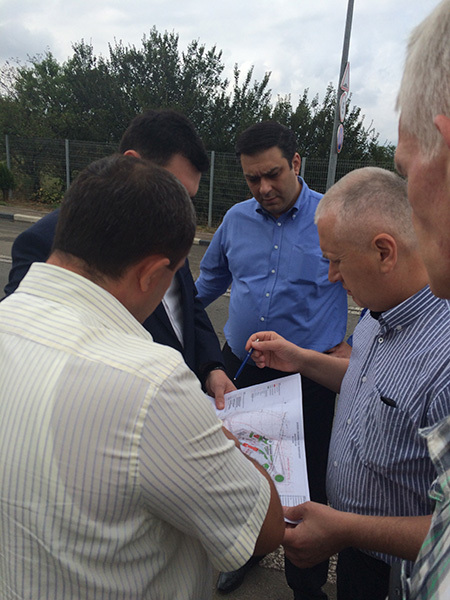 For the solution of the issues related to the border crossing simplified procedure application mechanisms, establishment of bypass roads and construction site, by the Armenian side initiative “The simplified procedure of entry and exit of the site of new bridge to be constructed at the Sadakhlo-Bagratashen crossing point area of the state border between the Republic of Armenia and Georgia ” was adopted by the RA Government Decree N 513-Ն as of May 19, 2016. 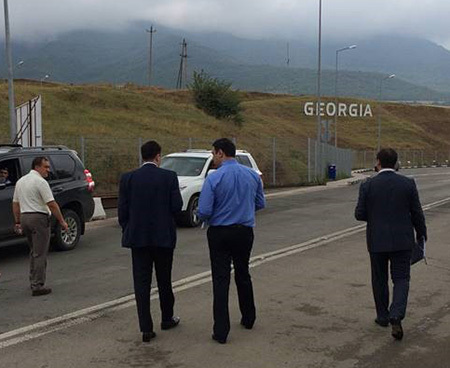 The Georgian side shall also submit a procedure regulating the entry and exit from the Georgian section of the state border. The issues related to the environmental, archaeological impact, land status, shall be studied and discussed in more detail in the bridge design phase. 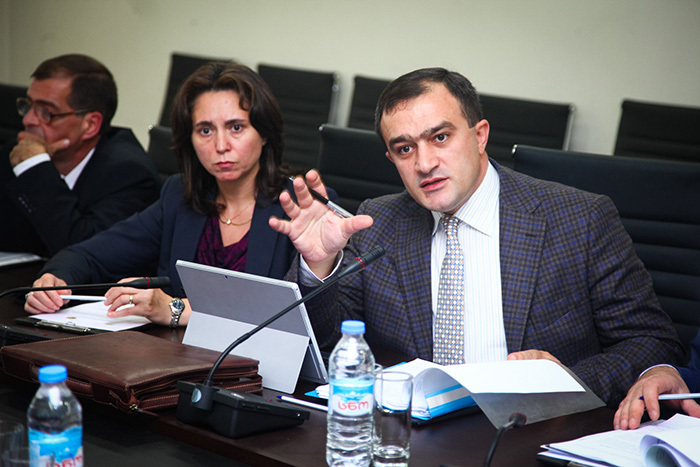 Armenian-Georgian teams participated in the seminar organized by European Bank for Reconstruction and Development /hereinafter EBRD/ on December 1 and 2, 2015 in Yerevan where the parties were introduced the peculiarities of organization of technical supervision, design and construction implementation bidding documents, as well as EBRD e-procurement platform. 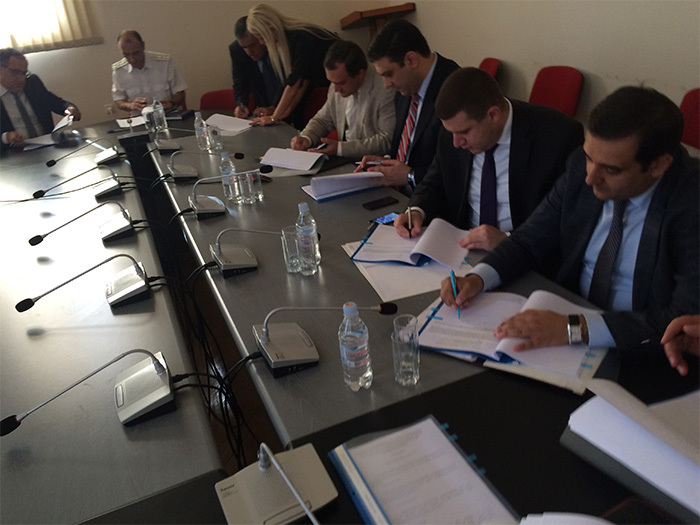 Tenders envisaged by the project will be carried out through e-procurement, /www.ebrd.com/ using EBRD e-procurement platform. 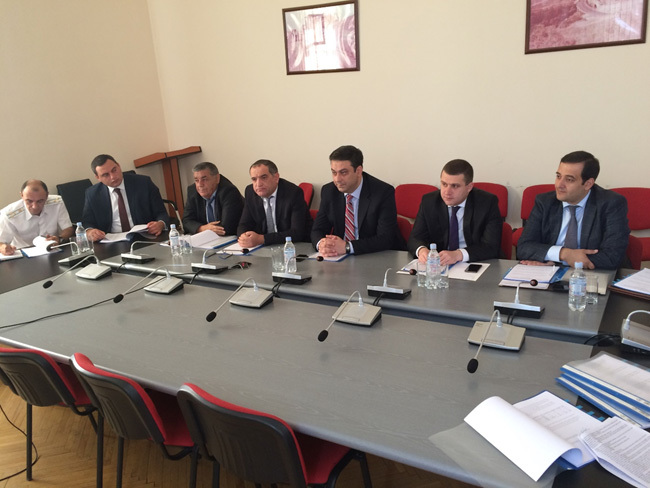 On October 26, 2015 the first Meeting of Armenian-Georgian Intergovernmental Joint Commitee took place at the Ministry of Regional Development and Infrastructure, Georgia. Thus, the organizational process of construction works of the new bridge called “Barekamutyun” to be constructed on Debet river has officially been launched. 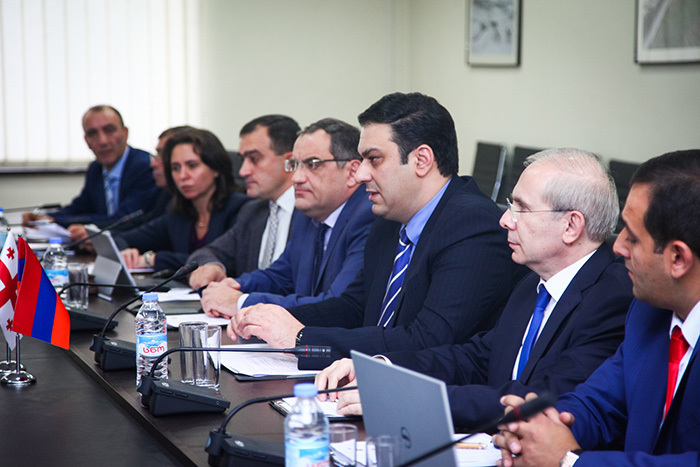 During the first meeting of the joint committee co-chairs Arthur Araqelyan the First Deputy Minister of the Ministry of Transport and Communications and Ilya Darchiashvili the First Deputy Minister of the Ministry of Regional Development and Infrastructure made the opening speech. 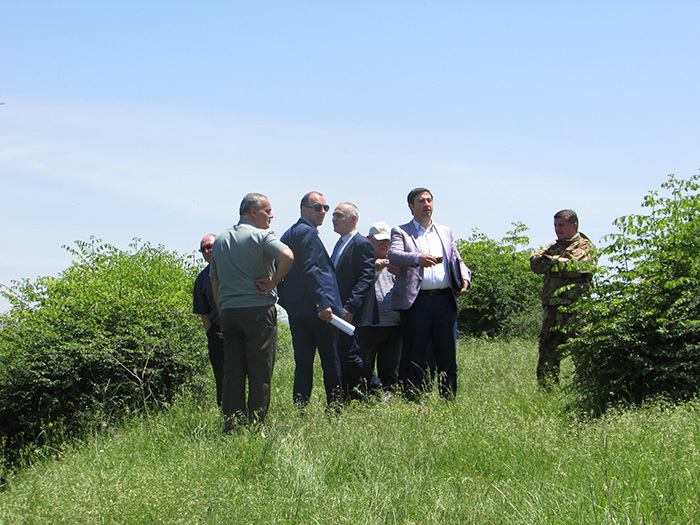 The parties highlighted the necessity and urgency of new bridge construction on Debet river at Bagratashen crossing point area of Armenian and Georgian state border, stating that the new bridge will facilitate cargo and transportation service quality, ensure time saving, safe and convenient movement through border crossing points. 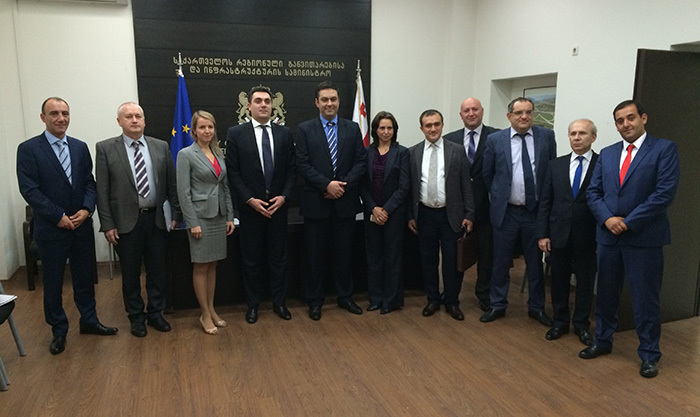 The Parties discussedthe number of functions arising from the Agreement signed between the Governments of Armenia and Georgia on December 24, 2014, including the main issues relating geology, environment, archaeology, social impact, infrastructure, transportation ofborder communication, approaching roadsconstruction, bridge construction implementation, two countries border crossing, construction materials through customs territory, import and export of construction materials and machines, and tax legislationissues relating the new bridge construction. As a result, the Parties proposed to involve specialists of appropriate fieldsto solve the above mentioned issues quickly to createproject implementation joint group, involving relevant specialists from each Party. 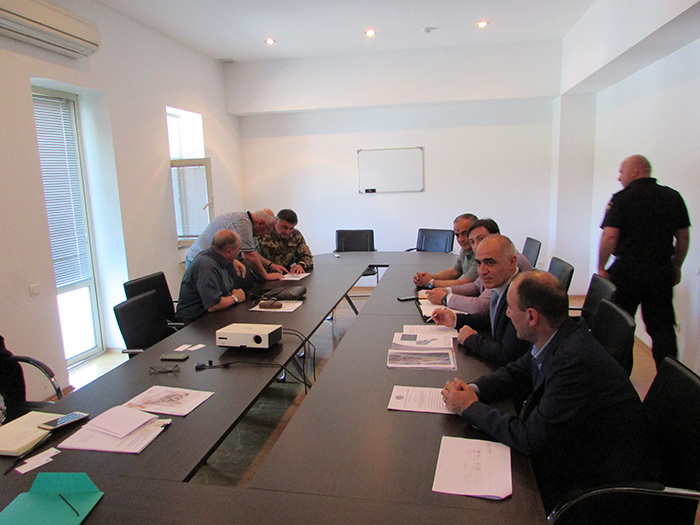 The mentioned group will organize and implement the procurement process to be announced in scope of project, in accordance with procurement guidelines of the European Bank for Reconstruction and Development / hereinafter EBRD/ and will ensure the solution of the issues relating environment, archaeology, geology, social impact, bridge construction and technical supervision, infrastructure, border communication, approaching roadsconstruction, border crossing, customs, tax, legal, contract management, procurement. The joint group of project implementation will submit the the existing issues and their solutions to the joint committee. 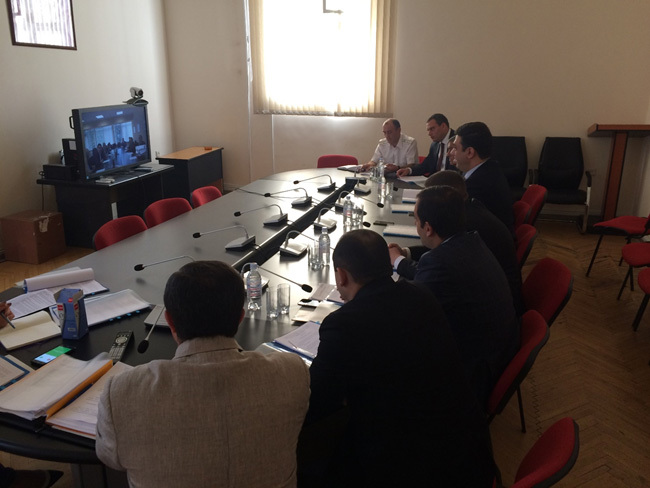 At the same time, for the purpose of assisting to works of project implementation joint team, the Parties decided to involve procurement international expert to introduce to EBRD procurement electronic platform peculiarities ( if necessary) and to operate them. The co-chairs noted with satisfaction about the the achieved substantial and tangible progress and mutually assured the successful launch of the program as well as their special intention and readiness for ensuring the future progress of the program. 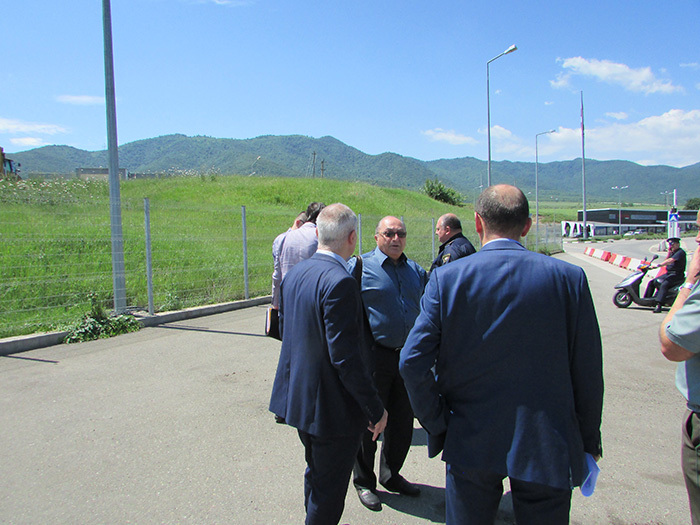 Visit of the First Deputy Minister of the Ministry of Transport and Communications and “North-South Road Corridor Investment Program” PIU, SNCOexpert team to Bagratashen crossing point on August 24, 2015 for regulation of mutual relations of new bridge construction over river Debet at Sadakhlo-Bagratashen State Border Crossing Point between the Republic of Armenia and Georgia. 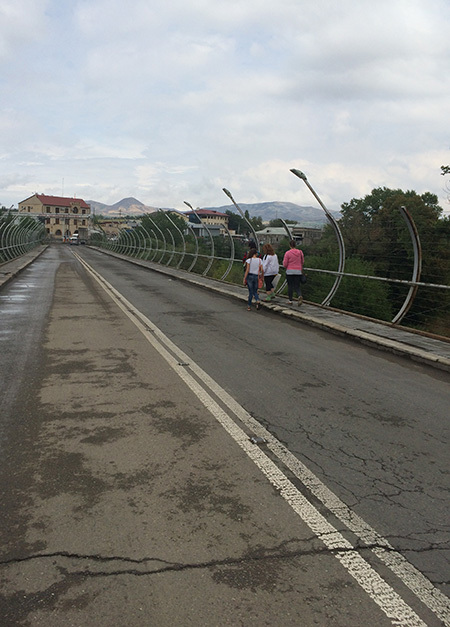 For the purpose of regulation of mutual relations of new bridge construction over river Debet at Sadakhlo-Bagratashen State Border Crossing Point between the Republic of Armenia and Georgiaon August 24, 2015, Arthur Araqelyan, the First Deputy Minister of the Ministry of Transport and Communications and “North-South Road Corridor Investment Program” PIU, SNCO professional team visited Sadakhlo-Bagratashen crossing point of the state border between Armenia and Georgia to discuss with the Georgian side the number of issues relating the construction of the new bridge. 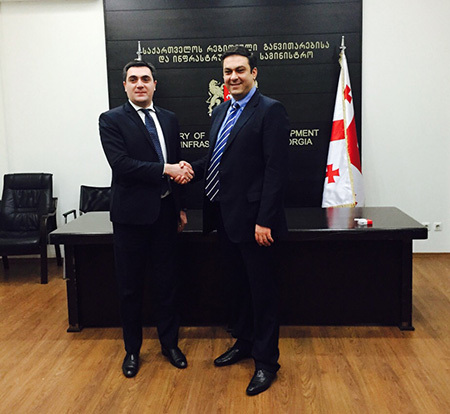 Georgian expert team was led by the First Deputy Minister of Regional Development and Infrastructure of Georgia Ilia Darchiashvili. The meeting took place at the cross-section of the two countries. 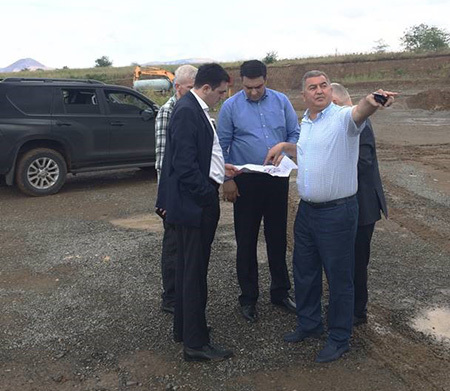 Bridge construction possible options were stated on site after which they moved to Armenian side where they continued the discussion of the main issues. 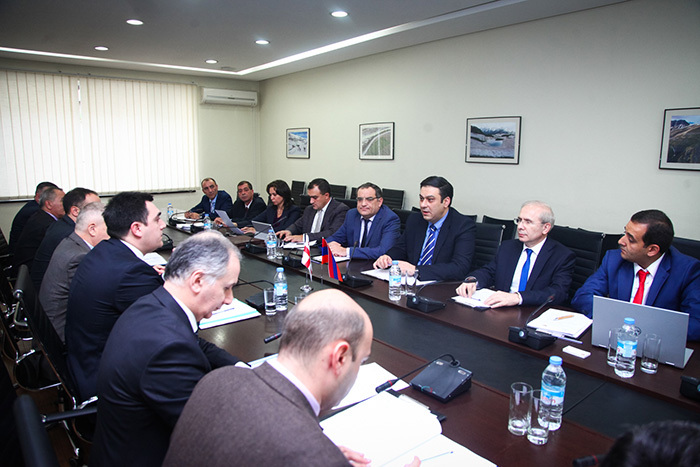 During the meeting the sides discussed the main issues relating geology, environment, archaeology, social impact, infrastructure, transportation ofborder communication, approaching roadsconstruction, bridge construction implementation, two countries border crossing, construction materials through customs territory, import and export of construction materials and machines, and tax legislationissues relating with the construction of new bridge over Debet river at the area of Sadakhlo-Bagratashen state border crossing point of the Republic of Armenia and Georgia. As a result, the Parties suggestedto organize and convene Armenian-Georgian joint intergovernmental commitee meeting to discuss and solve the mentionedissues.